Open up the floor and get better on offense by focusing on your team's spacing and relocation! If your team struggles to maintain spacing on offense, then watching Kelvin Sampson break down positional strategies and the ever-important pick & roll will help you learn to keep pressure on the defense at all times. Spacing is something that is often discussed, but difficult to implement throughout an offensive possession, especially at lower levels. Coach Sampson offers strategies in transition, half court, pick & roll, entries, and out-of-bounds plays to help improve your team's spacing. Sampson explains the difference between playing hard and competing, as well as how to get your players to understand the difference. He then outlines the "Five C's of Coaching" (Competency, Consistency, Confidence, Competitive, and Confrontation) and why they are important to being successful in the field of coaching. Next, he discusses the importance of practice, roles of assistants, staff meetings, becoming a better coach, modifying things you can learn from other coaches, and the importance of preparation. Coach Sampson is a firm believer in playing hard and competing, but reiterates that "shooting is not an equal opportunity employer." Sampson dives into the concept of spacing and discusses the mistakes many coaches make while utilizing a free-flowing offense. You'll see actions that Coach Sampson uses and how his team flows into their spacing offense out of transition. According to Coach Sampson, there are three things you need to be successful playing in a spacing offense: a point guard that can play out of pick & roll, a sprinter (the big who sets the screen), and a 4-man that can make a three. You'll be shown how to incorporate a ball screen into your spacing offense and how important the roll man is to its success. Sampson teaches post players how to sprint into ball screens and shows the "hit & go" technique that has become so popular in the NBA. The next phase is relocation to maintain spacing in the offense. Sampson believes that guards should have freedom to make plays and read the defense. All the movements are shown for the guards and post player when dribble penetration occurs and how to open up space for drives. 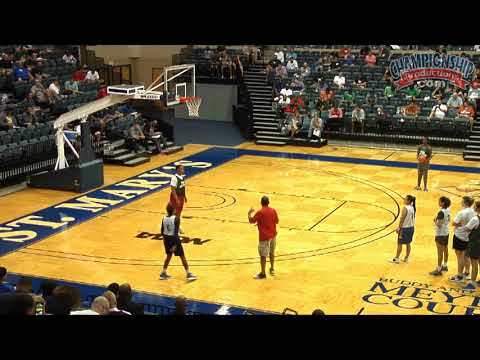 Coach Sampson gives you two drills that incorporate the ideas of the spacing offense. The first drill works on catching the ball on the move to improve a slower athlete's ability to attack the middle with the "beat them off the catch" concept. Also shown is the Three Man Fast Break drill, which works on getting the ball out of the net quickly and advancing it up the sideline. Finally, Coach Sampson shows multiple offensive sets, including an action out of pick & roll basketball that is sure to get your team a good look at an open shot. He then gives you a baseline out-of-bounds play that gets your team right into a pick & roll action. Regardless of what offense you run, spacing is paramount. This presentation will help you teach spacing and relocation within your offense and at the end of your set plays to lead to more points, open shots, and opportunities to attack the rim.